By now, as a French teacher, you've already made you've already made your decision as to how, if at all, to address the terrible events of Friday, November 13, in Paris, with your classes. You either chose not to address it, perhaps because your students are too young or because you didn't feel you had the appropriate amount of time to dedicate to it. Or maybe you spent a day or even a week on it with your students. Whatever it is you did, you had your own students' backgrounds and ages in mind when you made your decision. In this post I am going to share what we did with the French students at our school on Monday of last week. Social media was abuzz following the events, not only with updates as to the latest developments, but also with teachers sharing how they planned to address things with their students on Monday. Teachers were incredibly generous in sharing their lesson plans and resources on Twitter, Facebook, and on their blogs. 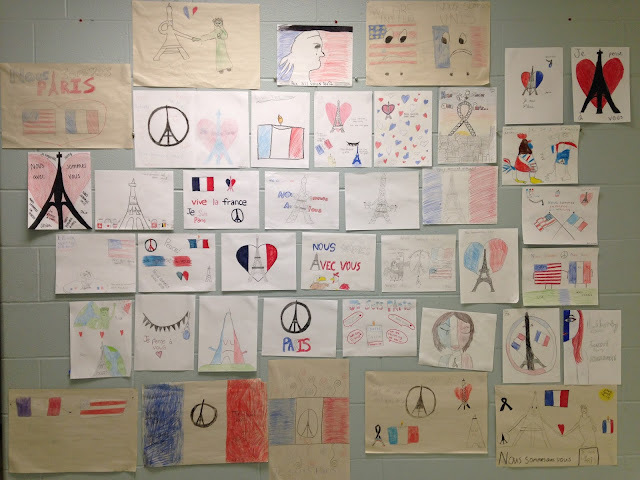 After perusing their ideas, and keeping in mind that I teach 7th graders, I decided that the best course of action would be to briefly address what happened without getting into too many details, share some facts about the United States' friendship with France, and then let them create posters to send to their pen pals in France in the form of a video. My colleague and I decided that it would be nice if we both did the same activity. 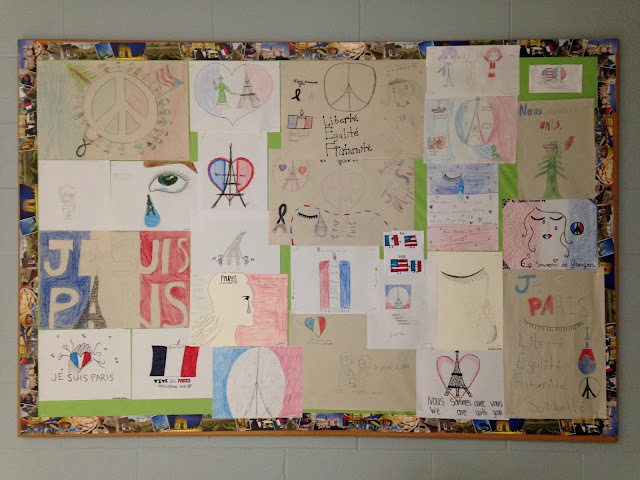 We each showed showed our students examples of designs that had been circulating on social media (the Jean Jullien Eiffel Tower peace sign, among others), and encouraged them to draw inspiration from those but also come up with their own designs. 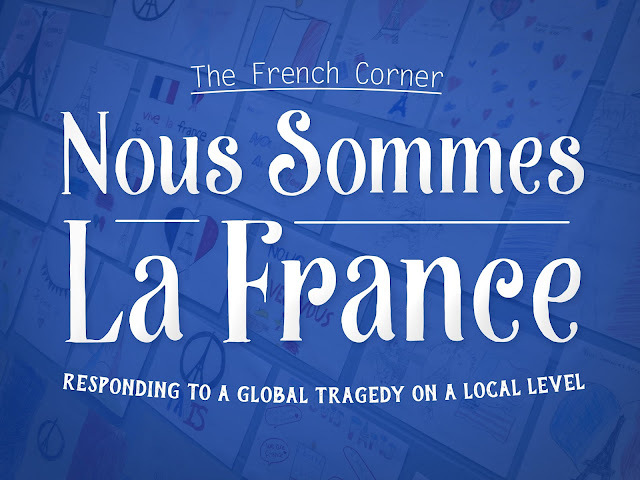 They could also include phrases such as "Je suis Paris," "Nous sommes la France," or "Nous sommes avec vous." I photographed each poster, then put them into a video. I sent the video to the school in France where we have our pen pal exchange (click here to read about the project). My students, the 7th graders, are excitedly awaiting their first batch of letters from their pen pals in France. My colleague's students, the 8th graders, wrote to students at the school last year. The English teacher at the school in France said that they really appreciated the video, and they posted it on their school's website. Our students here in the US were so pleased to know they had done something to lift someone's spirits following these tragic events. I don't think I'm exaggerating when I say that every student took this activity seriously. They genuinely wanted to do something to help. We hung many of the posters in the hallway and shared the video with the other teachers in the school, and many of them indicated how proud they were with the students as well. Some of them also showed the video in their classes. This was beautiful and made me cry. Thank you for doing this project with my son and his classmates. Thank you Mrs. Tremper. Your son and his classmates made me and many others very proud.